So the ‘I’m a Conservative really’ line that Ron Woodley spins on the doorstep of Thorpe is now laid bare- he is actively supporting the LibDems and Ukip. How can an Independent who claims to eshew all things political give his support to Cllr Longley, probably the most political Cllr on Southend and accept that a UKIP candidate if elected will be an ‘Independent’? This is nonsense and shows that the badge of Independence and the rhetoric that goes with it is nothing more than a front to denegrate conservative candidates and get themselves elected. 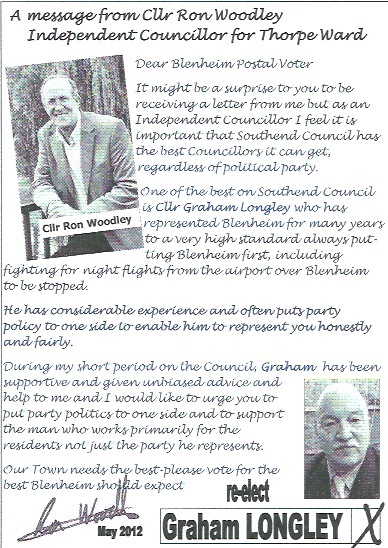 Incidentally did not Cllr Woodley sign the nomintion papers of G Longley LibDem when he stood against James Duddridge for the Rochford and Southend East seat? Shame on you Cllrs Woodley and Terry. In my opinion Cllr Longley must be very nervous in Blenheim and perhaps he is right to be! At the same time the Independents are listing the ex Conservative Cllr Aylen as one of them! Cllr Aylen was deselected by his ward as he was not up to the job, Cllr Velmurugen (Independent) was heard to say to Cllr Aylen that he would support him – astounding since Cllr Velmurugen is a practising doctor and Cllr Ayen has openly stated that he cared not if smokers died of cancer!